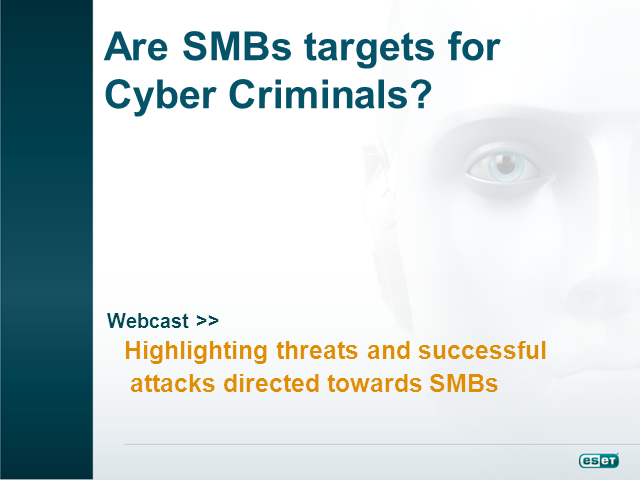 Are SMB’s targets for Cyber Criminals? The Internet is a force multiplier, allowing businesses of all sizes to reach more customers, better service those customers and ultimately be more competitive. By utilizing the Internet, many small and medium businesses can be much more successful. However technological advances cut both ways. While improved connectivity, communication, and Web presence provide benefits to small and medium businesses (SMBs), it can also resulted in an increase of Internet based security threats and expose the business to criminal elements that they wouldn't normally encounter. If customers can find you so can cybercriminals. The most damaging cyber attack against small and medium businesses is when cybercriminals implant malware on a company's computers, and use that malware to gain access to the company's bank accounts via online-banking. Join ESET Malware Researcher Lukáš Štefanko and ESET Solutions Engineer Ben Reed to learn the five components for a winning mobile security strategy and see why replacing your current MDM with ESET mobile solutions can cut costs while boosting security. Why have two-factor authentication (2FA) in the workplace? Even if you’ve instituted password management best practices, employees will still use their work password on other websites, write their passwords on sticky notes, or use their nicknames or birthdays without a second thought—and put your business at risk. With new PCI-DSS regulations surrounding multi-factor authentication requirements coming up on Oct. 31, it’s time to get up to speed on this proactive technology. •Account credential theft: What can be done to prevent employees from falling into a trap? •How 2FA/multi-factor authentication can reduce the risk of account hijacking, mitigate weak passwords and help satisfy compliance requirements. •The types of multifactor authentication solutions available on the market and how it can contribute to creating a stronger security culture in the workplace. Utilize SysInspector to troubleshoot what might be going wrong with a computer. Winter is coming. Our three-eyed raven answers your top 5 IT security questions based on our most recent survey including email security, ransomware, protecting IoT and more. Additionally, here's your chance to ask our in-house cybersecurity expert, Michael Aguilar, your most challenging questions to help you defend the wall. It’s an open forum just for you! With a personal record of 34 questions in 30 minutes, Michael will torch your questions like Drogon. Sign up today and get those questions ready. Interested in encryption, but not sure where to start? Watch “Encryption: Decoded” for insights on how to select the right solution for your environment. You’ve seen the headlines on ransomware, developed by cybercriminals to encrypt and hold computers or data hostage. Now, join this webcast for an in-depth look. ESET senior security researcher Stephen Cobb and Larry Ponemon of the Ponemon Institute discuss a new study on healthcare security addressing causes, costs and potential cures for soaring cybercrime rates. Are you considering a Next-Gen AV solution? Before you make a decision, attend this webcast with an ESET engineer who will examine vendors’ claims and supporting technologies. How is the landscape changing for cybersecurity and what do businesses need to know to protect themselves? From large scale data hacks to credit card breaches, Sr. Security Researcher, Stephen Cobb, looks at the major trends in cybersecurity for the upcoming year and discusses the tools and resources available to protect against them. Join Distinguished Researcher, Aryeh Goretsky, as we explore what's new in Windows 10 and how to make sure your company is ready to migrate. End users are increasingly shifting their IT services to managed service providers and the scope of both technology and services offered by MSPs is constantly evolving. Join ESET and LabTech Software, the industry-leading IT automation software, as we explore these changes and what it means for businesses. The EMV Compliance Mandate is set to take effect in the United States in October 2015. These new credit card processing procedures mean big changes for retailers and businesses. Is your company ready? Find out what you need to know. Is antivirus dead? Absolutely not. Join Distinguished Researcher, Aryeh Goretsky, as we explore how antivirus is evolving to adapt to modern threats and why it is still a critical layer to a complete security solution. This webcast will look at trends reported at the annual Virus Bulletin conference in Prague. In advance of October's Executive Women's Forum, Security Researcher Lysa Myers will look at the evolving landscape for women in IT, risk management, information security and other privacy industries. Security Researcher, Cameron Camp, discusses seven ways in which malware threatens your virtual systems and the increasingly mission critical data and services that those systems handle. Given a thriving black market in stolen information, and the wide availability of the tools with which to acquire it, no virtual attack vector is likely to be neglected by the bad guys, from compromised executables in virtual server images to virtual networking connections between mobile end points. Drawing on the latest malware research, Camp looks at how malicious code is adapting, and may be adapted, to penetrate virtual systems. Join Security Researcher, Cameron Camp, as he reviews the latest in cyber security covered at this year's Black Hat Conference. Your company can learn valuable lessons about risk strategy and incident response from what happened to Hacking Team, a firm that supplies surveillance tools to government agencies. Widely accused of helping governments spy on dissidents and journalists, Hacking Team found itself hacked with embarrassing, possibly damaging results. ESET senior security researcher Stephen Cobb explains the missteps made and the lessons to be learned during this webinar. Learn how to protect the Mac platform in your business. Title: Are SMB’s targets for Cyber Criminals?